After this year's Academy Awards I became curious if it was possible to buy a realistic looking Oscar. From Hollywood Boulevard souvenir shops to movie memorabilia websites, I've seen all manner of knock-offs that were certainly Oscar inspired, but in no way actually resembled the real thing. Sure, the day may eventually come when I find myself working on that dream project that gets me closer to the actual award. Until then, I found this. Getting Leo's mail by accident. I ordered this Oscar statuette from a professional movie prop company in Hong Kong. 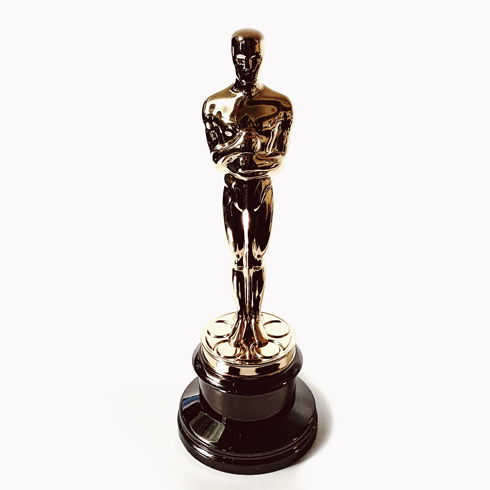 Not only does it look like the real deal, but it's pretty much as close as you can get to an authentic Academy Award without winning it yourself. The sculpture is completely accurate, and just like an actual Oscar it's 13.5" tall, weighs 8.5 lbs, and is 24K gold plated. As a result, you'd be correct in assuming it was a bit more expensive than the novelty statues I previously came across in those souvenir shops. So aside from being an interesting conversation piece, you might be asking what's the point? Well, if you saw this post on my Facebook or Instagram you'll already know that I made myself a faux Oscar back in high school before heading off to film school. That art project is something that I've kept and displayed year after year as a symbol of my early film ambitions. It's also a personal reminder of my achievements in that pursuit. Buying an almost-real Oscar isn't because I take myself that seriously. It's because it's another symbol. A bit of motivation and/or fantasy perhaps. Frankly, it's just one of those things that I would've loved to have had as a student, but never could've afforded. Just as I've enjoyed seeing my handmade Oscar on the shelf, this new one will look great standing right next to it.